I enjoy preparing street food fare at home. It’s comforting and unpretentiously rooted in Indian culinary tradition. Today, I’m blogging Mumbai’s famous street food, my kind of comfort food – Pav Bhaji. 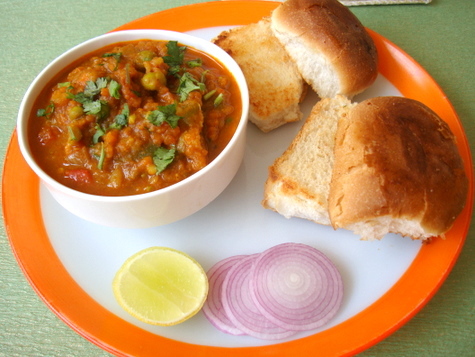 Pav = Soft Bun and Bhaji = a mashed mixed vegetable curry prepared with Pav Bhaji Masala. The key to a good Pav Bhaji lies in the quality of bread and the masala that goes into the making of the spicy bhaji. Makes for a filling evening meal. 1 Pressure cook potatoes, cauliflower, peas, beans and carrot along with 1 cup of water, till soft. Drain any left over water and keep aside. Mash all the cooked vegetables using a masher. 2 Heat oil in a vessel, add the green chillis and onions and saute for 4 mts. Add the ginger-garlic paste and saute for another 3 mts. Add capsicum and saute for 2 mts. 3 Add the chilli pwd, turmeric pwd, pav bhaji masala, sugar and salt. Combine well. Add the tomatoes and cook until soft, approx 5-6 mts. 4 Add the mashed vegetables along with a cup of the drained vegetable stock and cook on high for a mt. Reduce flame and simmer for 14-15 mts. 5 The gravy will begin to thicken. Adjust the salt, if required. Turn off heat and add butter and lemon juice and combine. Garnish with fresh coriander leaves. 6 Serve hot with lightly toasted pav/pau and sliced onions. 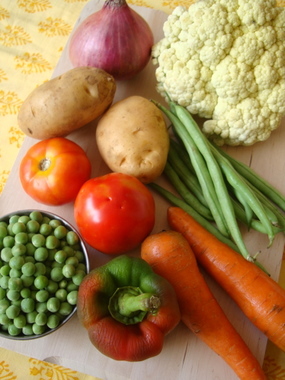 You can use 2-3 vegetables also while preparing the bhaji. I have not used cabbage and beetroot since I did not have them on hand at the time of preparation. Using beetroot will lend a deep reddish purple color to the bhaji. Thank u once again sailu garu…. what brand pav bhaji masala u prefer? I use Everest Pav Bhaji Masala. Will surely try this week at home. As usual, gr8 recipe and good pics too… I just wanted to clarify, do we really add cabbage to Pav bhaji ( as mentioned by u)… am not sure of that..
Cabbage is an optional ingredient, Kalyani. I have not added cabbage to the bhaji. Wonderful recipe, as usual. Just one thing I wanted to mention…When I make Pav Bhaji, whenever time permits, I try and fry the onions n tomatoes in different pans and then combining them(I use ginger-garlic paste and that gets fried along with the onions). This gives it a brilliant twist and I remember having heard this from a roadside vendor at Mumbai. It always works for me…wonder what makes the difference! Please post the pressure cooker cake recipe………eagerly waiting for that……. Mmm looks lovely. I have been eating this non stop for two days since making far toooooo much for my daughters birthday yesterday!! 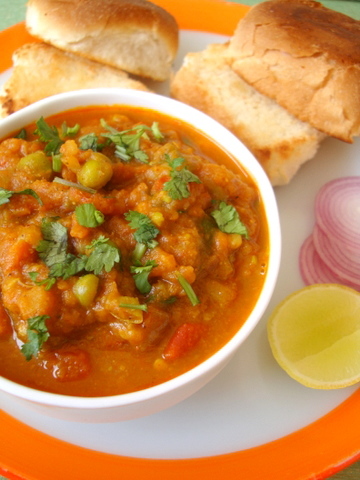 I love pav bhaji, it looks yum…..thanks for sharing! 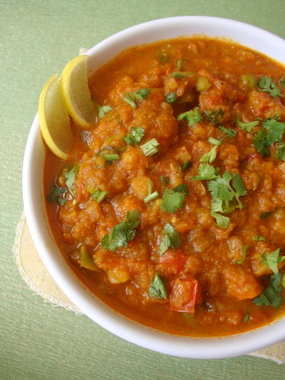 i want pav bhaji masala recipe. how can make it? I love all the veggies in this dish. It looks great!! Thank you so much for posting this recipe. I have been wanting to make one for ages since my hubby loves pav bhaji and was looking for the rite recipe. As always, your pic looks delightful and thank you for your wonderful blog. I totally disagree with Sri comments. I feel most of us do not leave comments, though we love the recipe and do try it at home. I myself look out for a new recipe every other day, but I do not leave comments every time. I don’t know if the responses count has anything to do to prove that “Sailu’s food” is the best. You rock Sailu and ur blog. I like your website and your recipes.I not only look for recipes but just to make me feel nice and happy. When I am home sick or not in a good mood, when I just come to this website and browse i feel good after some time. It makes me feel good. Thank you for everything you are doing. Really nice recipe. I think anything with that many vegetables must be really healthy. I might make this a eat the left overs at work. Yummmmooo, thanks for posting the recipe. Another tip that a roadside vendor shared with me was that they add a little cooked chana (chhole)to the pav bhaji. Most of you will have noticed how thick and mashed up the vendor pav bhaji looks and tastes. I have followed it and it definitely gives a nice texture to the pav bhaji. cooked in d pot ? Thanks you for this great recipe:-). Its really greatly helped me. wow…thats an amazing recioe, gona try today itself……..thanks a lot sailu!!!! Just the thing I need for today!! A rainy day. Will make this with the bun recipe..U rock Sailu:).. I love this recipe! some of the spices remind me of some of the Armenian dishes that I make! thank you for the great recipe! absolutely delicious! Hi Sailu, Thanks for the recipe. Can you also provide the recipe for the pav bhaji masala or suggest which brand you use. My PB always goes for a toss and I suspect its because of the masala. Thanks! Thanks very much. I did it exactly by the recipe and was little skeptical in the beginning. But it turned out to be way better I had expected. Wonderful recipe and dish. which pav bhaji masala did u use?